The bkr Lola Glass Water Bottle was inspired by moments that are so impossibly cute like the ever-deepening blush of your cheeks that time you took the elevator up 50 floors to see a new crush, big lips big hair big lashes, wearing a pink fur to afternoon tea and the most beautiful florist boutique next door to your apartment in Paris. 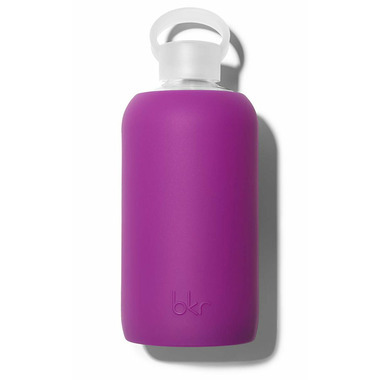 Very solid bottle with a wide base that provides great stability when standing upright. A little heavy since the bottle is made of glass but still quite portable. Love it! It's great to use for my shakes and when I'm at home because the glass is heavy. This is by far my favorite brand of glass water bottles because of the small mouth opening. No spill when drinking on the go. I have all sizes and love them all for different reasons.